It’s the 17th of the month again, which means it’s exactly 22 months since I arrived in Bangalore. More to the point, it also means I had to get my employment visa renewed. So today I spent the whole day in or around the Foreigners Regional Registration Office, or FRRO–an acronym that strikes fear into the heart of many an expat in India. I had been looking forward to this about as much as a visit to the dentist (clue: I hate the dentist), but it’s done and now I’m sorted for another year, with a visa extension and a new residency permit. And at least it only took one day this time. I’d been dreading it because the last time I had to do it, to renew just my residency permit back in December, it took three whole days of going there, being told that a document was missing (or formatted very slightly wrongly), having to go away, get it done again, or get something printed or xeroxed, going to the police station, waiting for cops to turn up at the apartment to check I lived there, etc etc. And when you’re teaching, having to reschedule 3 days worth of classes is not so simple either. Today–thanks to our wonderful HR Executive, Roshan–I went along with a carefully-prepared selection of 25 different documents (I counted them). Tax documents, proof of address, ID, provident fund contributions, yadda yadda yadda, and yet they still quibbled. But at least nobody even mentioned a police check. (The Iranian student who was in the queue in front of me got one though.) And I was fully prepared for arguing, and knowing that you have to do it with exactly the right balance of being assertive, but not raising your voice or getting anyone upset. I’ve become so used to the over-the-top bureaucracy here that I invariably end up expecting the worst, but quite often it turns out not so bad after all. Shanti shanti, all is well. 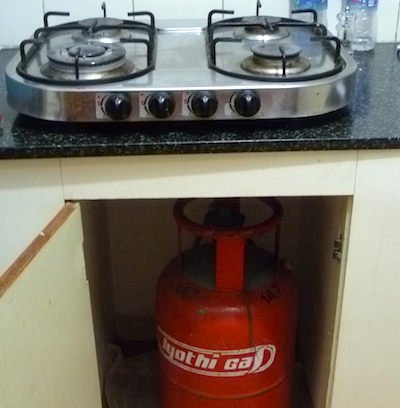 Case in point: my gas bottle finally ran out at the weekend, which meant I couldn’t cook on my hob any more. It’s not an exaggeration to say I had been dreading this, because for some reason, possibly terrorism-related, it’s supposed to be really hard to get a “connection” (actually just a replacement gas bottle) without all kinds of paperwork… but I hadn’t had to do this before, so I didn’t really know. You’re supposed to be registered with the government and have a number and stuff. I was emailing my landlord in Dubai asking him about it (didn’t have any number), and I was hoping the maid would help (she wasn’t keen), but in the end I just phoned the number of the local Jyothi Gas dealer. I was expecting the usual awkward faffing around on the phone. I’m pretty phone-o-phobic at the best of times, but when you try to communicate with someone who has poor English, typically here on a very distorted phone connection, it’s quite exasperating. There are only so many times you can ask someone “sorry, can you repeat that?” before it gets too embarrassing. (Three times, I find.) Once or twice it’s taken me a while to realise they weren’t actually speaking English after all. And the Indian habit of saying “Hello? Hello?” at random points in the conversation takes some getting used to. Quite often I simply had to abandon a telephone conversation completely because we couldn’t understand each other. Face-to-face communication is so much easier in these situations even if the language barrier is still there, and non-verbal communication can help a lot. But in the end it was a crystal-clear phone connection, the guy at the gas dealer’s spoke perfect English, and–glory of glories–he didn’t even mention anything about registration or a customer number. Result! I asked them to deliver after 6.30pm when I would be home from work (they almost always assume a maid or someone will be home during the day otherwise), and we were done. Well, almost. After getting home nobody had turned up by 8pm so I decided to get my shopping done just up the road, to avoid waiting in all night on the off-chance, but nobody turning up. They had my mobile number, so if they came when I was out, they would call and I could come back straight away and we would be sorted. Not so… getting home with my shopping, the security guards explained in their usual mix of miming and 1 or 2 English words that the gas had been, and gone away. Damn! In the end I just called the nice crystal-clear man again. “No problem”, he said. “I will send my person there again right away”. And he did. And he was in and out within 5 minutes, taking the empty bottle with him. So, in the end a good transaction and good service, and all over in a couple of hours. After I’d been worrying since June–for 4 months!–what would happen when my gas ran out. I did learn how to be very frugal with it though.